Radio Beach is Oakland’s nearest thing to a natural beach. It’s city land, on the north side of the Bay Bridge approach past the toll plaza. There is no lonelier or prettier spot on Oakland’s waterfront. This is the view toward the bridge as you enter the beach. 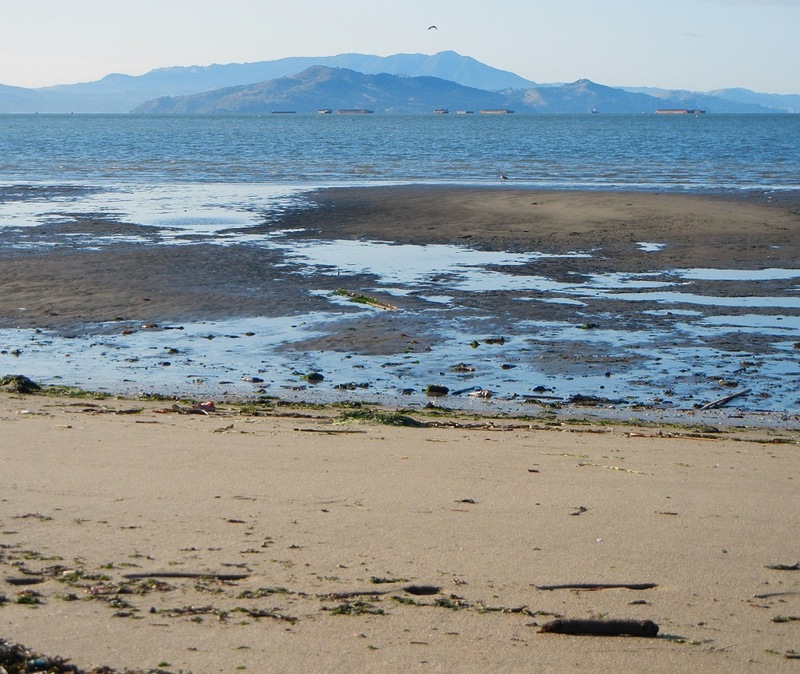 This was near low tide yesterday, and the mudflats stretching all the way to Emeryville were tempting. Here’s the view back from the other end, with some of the radio towers. And here’s the view out, with Mount Tamalpais, Angel Island and the Tiburon Peninsula on the skyline. Click the image for a 1000 pixel version. The sand is very fine grained, given the energy of the waves and the available sediment in the Bay. It collects here where a little extra wave energy gets focused, against the buttress of the bridge approach. Not a super beach, but a real one. This entry was posted on 8 November 2011 at 11:53 am and is filed under Oakland geology views, Oakland streams and water. You can follow any responses to this entry through the RSS 2.0 feed. You can skip to the end and leave a response. Pinging is currently not allowed. I used to bird watch out here in the late 1970’s-early 1980’s when there was still a broadcast station and a number of small shacks on the pier that went in a semi-circle into the emeryville flats. Neat little out of the way place. 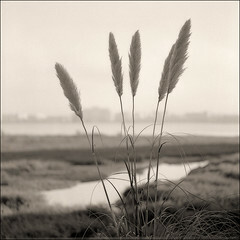 I sometimes still go nearby to do some marsh photography. It’s like a world away from the heavy I-80 traffic and the backed up bay bridge. I hope with the new bridge the access is not restricted, nor opened up to much either. The shacks are gone, but there are still pilings and stuff along the edge of the marsh. The sailing folks of Berkeley/Emeryville like to hold picnics out on a sandbar in the mudflats during especially low tides. How does one get to the beach? You take the West Grand Ave. exit off I-80 and take an immediate right, then follow the road to the end. This is part of the “Emeryville Crescent” section of the Oakland/Berkeley Christmas Bird Count circle that I’ve helped out with for the past few years. Bob Hirt, the section leader, knows way more about it than I do, but we’ve seen some cool stuff out there, e.g. Short-eared Owl, California Clapper Rail (now Ridgeway’s Rail, ugh), numerous shorebirds. We almost always time the count so we’re there around high tide (presumably for rails) so I’ve never explored the mud flats, but now I kind of want to.